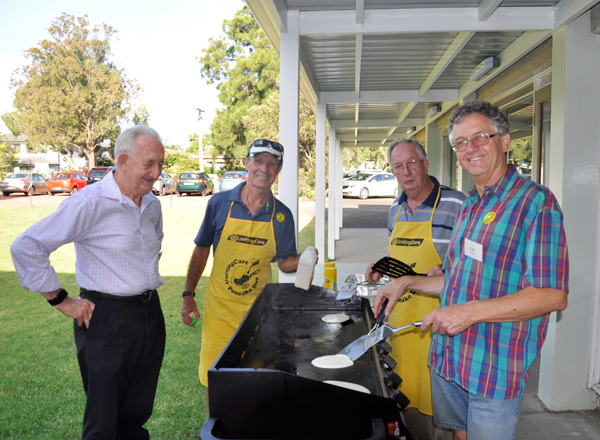 Pancake night at the Beaumaris Uniting Church – St. Martin’s on Tuesday 13th February at 6:30pm was a great success. 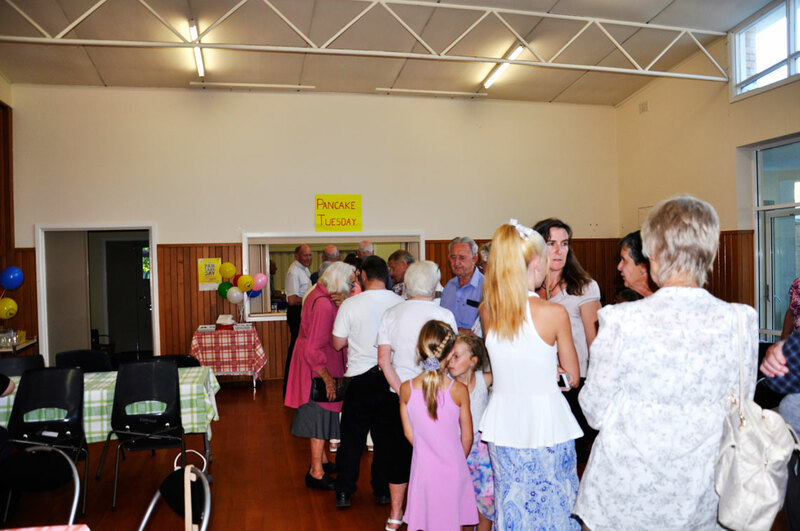 Approximately fifty people indulged themselves on delicious pancakes with a range of fruit toppings and ice-cream plus a wide choice of drinks. 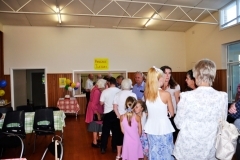 Our thanks go to all those who organised the event (especially Wendy Hinde), set up the hall, prepared the pancake mix and various add-ons and cooked and served the pancakes and drinks. 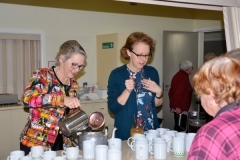 It was a great opportunity for chatting and catching up on peoples’ news at leisure with all money raised going to Uniting Care. We raised $480 to help families in crisis. Click on the link to enjoy the photographs of the evening. 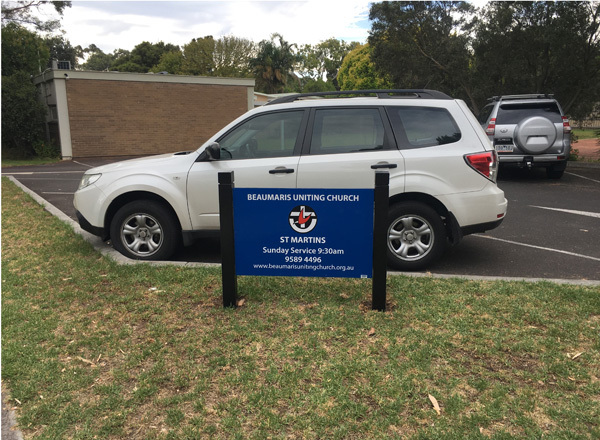 Today we had our new signs installed on the corners of our site. It has been a long process getting them designed and produced. In the end we opted for a very simple design and believe they are very effective. We have had an anti-grafitti coating put over them. We’re delighted with the outcome. 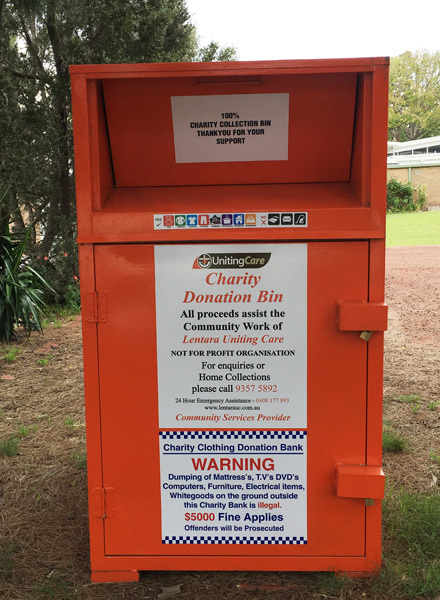 All proceeds from our Charity Donation Bin assists in the Community Work of Lentara Uniting Care. The Charity Bin is emptied twice each week (Mondays and Fridays) but more often as required. 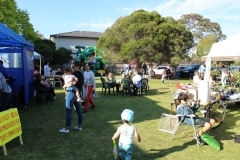 If you require a home pickup please contact Lentara direct on 9357 5892. Their volunteer team of collectors will be delighted to assist you in removing items you no longer require. This includes clothing, furniture, toys, and all household items. There are plenty of less fortunate people who would love these things. 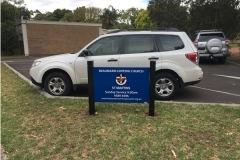 Lentara is an agency of UnitingCare Victoria and Tasmania, which is the Victorian community services arm of the Uniting Church in Australia. Across Australia, UnitingCare is one of the largest providers of community services with over 1,600 sites, 39,000 employees and 27,000 volunteers, supporting more than 2 million people every year. 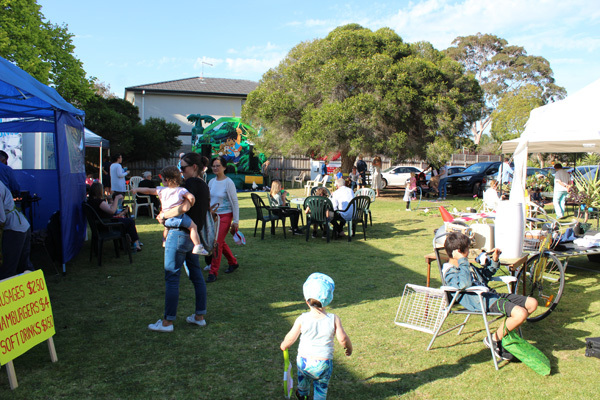 Lentara supports some of the most vulnerable members of the community, providing support and access to resources that are critical for sound health, wellbeing and participation in local communities. 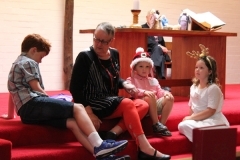 Lentara’s services are provided to all people irrespective of age, race, religion, language, ability, gender or sexual orientation. 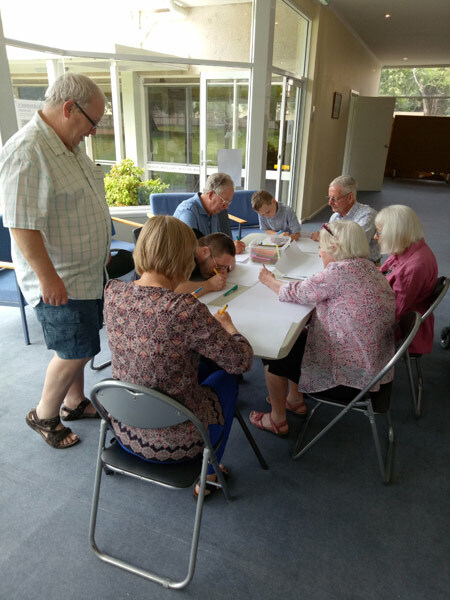 The first session of our monthly Friday Morning Discussion Group was held at the church on Friday 2nd February from 9:30 – 11:30am. Marg Thorburn got the year’s discussion off to a good start. Inspired by a list “99 reasons 2017 was a good year” on a blog called Future-Crunch and an Age newspaper article “Welcome to the Good Times” we pondered the recent hopeful developments which have come from many sources across the globe. Hopefully we all discovered many good causes for optimism regarding the year ahead. The discussion was very lively as we went through the Future Crunch list and we could easily have spent another hour with this topic. We publish this topic so other church members can also be inspired as we move through the year ahead. Every January, a new pair of hideously coloured (but deeply discounted) running shoes are purchased in the sales, before the local supermarket is hit for dozens of new ingredients. By every December, the needle of the bathroom scales has returned stubbornly to place and my supermarket trips are little more than grabbing some cellophaned tin trays on the way home that can be whacked in the oven for 35 minutes while I finish off emails or read the next day’s briefings. I recognise the two results are not unrelated. But every year, the intent is there. The wish is genuine; the resolve is real. Indeed, I currently have a pot of homemade chilli on the stove and I’m slow-cooking a gammon in ginger beer, to be used for cold cuts later in the week. I’ve even downloaded a running app to my phone. I am ready to be a better me in 2018. And that’s why I love this time of year. No matter the widespread grumbling at the cold weather or multiple television repeats; it’s the sense of renewal, of hope and of potentiality that I find affirming. It’s the millions of silent vows attested across the country – this will be the year to get a new job, or ask for my partner’s hand, or take up a hobby. And we need that in public life, too. I can’t count the number of columns or articles I’ve read bemoaning how execrable 2017 was. The culture wars in America, the twists and turns of Brexit, the deaths of pop stars and the ruination of sport, either through another Ashes failure or the distorting effect of Neymar’s bank-busting transfer to PSG – all of them used as ciphers for a fear and desolation that life will march to the incessant drumbeat of everything getting worse. It has to stop. Life isn’t worse. The world is a measurably richer, healthier, better-educated and more equal place than at any time in my lifetime. Extreme poverty is being routed. Infant mortality has halved. Literacy rates are climbing. After two centuries of increasing global inequality, developing world growth has reversed the trend. That is not to diminish the challenges of now or of the future – of social isolation, industrial automation, a surge in populist nationalism or the continuation of mass global migration – but it is to recognise that we have met the challenges of the past head-on, and come out the other side a better world. I’m not yet 40 and, if I ever have children, I’m not sure how I’ll explain that my own childhood was marked by half of Europe under the yoke of communism. That TVs had only three channels. That only a fraction of school-leavers went on to tertiary education and there was no such thing as Google – you actually had to know stuff. How do you tell a youngster that for a significant section of my life there was no shower in my house; no personal computer; no internet; that the only phone was bolted to the wall and had a rotating dial; and that, when I was born, not only would I have been barred from marrying my fiancée, but – in Scotland – homosexuality was a crime punishable by imprisonment? How do you explain to someone born now – who sees both inflation and unemployment running at less than 5 per cent – that I was born in the winter of discontent and all that entailed? That Britain had mass strikes, electricity cuts and the dead were left unburied? Future generations will study the technological advances of our age, the explosion of clean energy, of disease eradication and feeding of the developing world. But we can neither wallow in nostalgia, nor grieve for achievements we feel shall never be matched. The start of a new year is a time to assess where we are, where we’re going and – crucially – what we can contribute. Twenty years ago, in 1997, British Army soldiers were still laying landmines that would maim and kill long after our troops left theatres of war. Now, the UK is leading the campaign to make the world landmine-free by 2025. If we do so, it will be our generation’s smallpox moment and a source of national pride. Intergenerational unemployment is on the way out. Fewer and fewer children are living in workless households, meaning more have the example of work and see the dignity and independence a job can give. This creates two virtuous cycles – one of increased opportunity and increasing employment growth, the other of increased tax returns, meaning borrowing will be lower than predicted. As global poverty is reduced and issues such as infant mortality and girls’ education are tackled, so we see the environment being considered. Even in countries such as China – where economic growth has been prioritised over all else – the demand for clean air and water means 2018 could be the biggest year for green advances since the industrial revolution. And at home, where the political debate has been soured by the scratchy tribalism always left over by binary referenda (and remember, in Scotland, we’ve had two – we know how divisive they are) compounded by fake news, cyber-trolling and Russian Twitterbots, we are gradually seeing voters from both sides coalesce around a “just bloody get on with it” position. It might not seem much, but this is the first step to the country coming back together. Policymakers, journalists and qualified authorities are beginning to properly challenge the lazy and mendacious online; the next generation of politicians is showing the renewal of the body politic made flesh and those at home no longer satisfied to shout at the television are deciding to get involved and do something about it. We have a more aware, more activist, more philanthropic generation willing and able to use new technologies to band together with like-minded souls across the globe in order to change the world for the better. New Year is a time for renewal; for new hope and the resolve to be better – better individually, better collectively, better nationally. As George Eliot wrote: “It is never too late to be what you might have been.” Happy New Year. As has been our practice for many years, we plan to celebrate Pancake Night at the church in the traditional way. If you wish to participate, plan to come to the church for pancakes, as a dessert to your normal meal, at 6:30pm on Tuesday 13th February. The hall will be open from 6pm for those who would like to enjoy a picnic of for example fish ‘n chips. 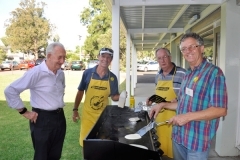 All proceeds go towards UNITING and will be helping Australians living in crisis including those experiencing homelessness, domestic violence, addictions and financial hardship..
Every year people come together for Pancake Day to flip for a good cause. 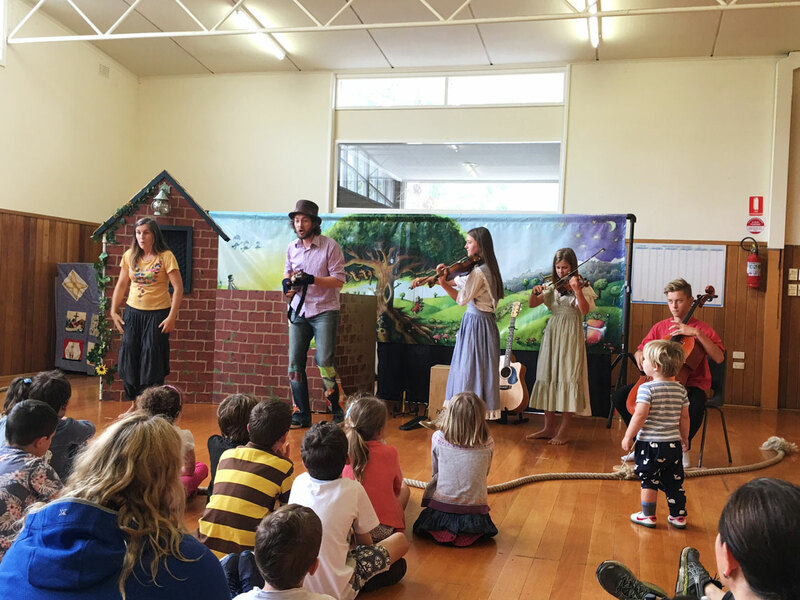 The reality is that 1 in 7 Australians are living in poverty with 1 in 6 children affected, that’s 2.9 million Australians too many. 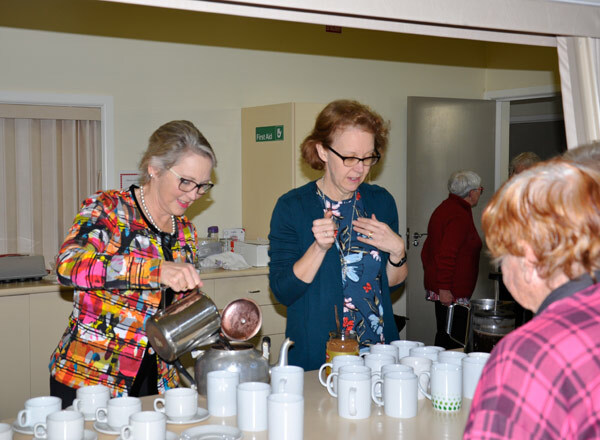 We are very grateful for the donation of ingredients from Woolworths store in Balcombe Road, Mentone along with those of members of the church community. Traditionally, Shrove Tuesday is the last day to eat all the flour, eggs and dairy products in your kitchen before the start of Lent which is a time of abstinence and reflection in the 40 days before Easter. The European custom of making pancakes on Shrove Tuesday was one way to use up these ‘luxury’ items. 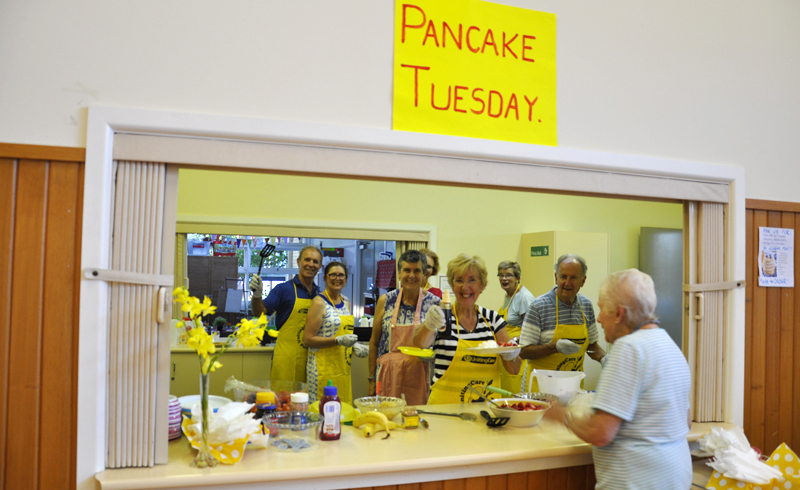 Shrove Tuesday, or Pancake Tuesday is also known as Fat Tuesday! Who is Uniting – and what do they do? 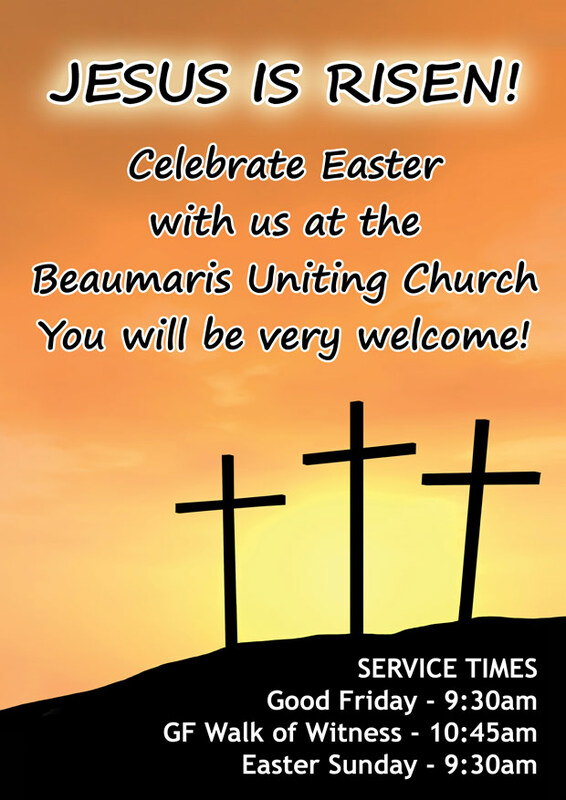 Uniting Vic.Tas, known as Uniting, is the community services organisation of the Uniting Church in Victoria and Tasmania. We’ve been supporting Australians for over 100 years. We’re about building capacity and confidence in children, young people and families, people with disability, older people and people newly arrived in Australia. 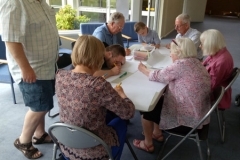 We work with people at risk of or experiencing financial crisis, homelessness, mental illness and problems with alcohol and other drugs, by empowering them with the support they need to succeed. 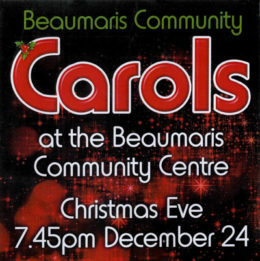 Once again the Beaumaris Uniting Church hosted the 41st Community Carols held behind the Beaumaris Community Centre on Christmas Eve. 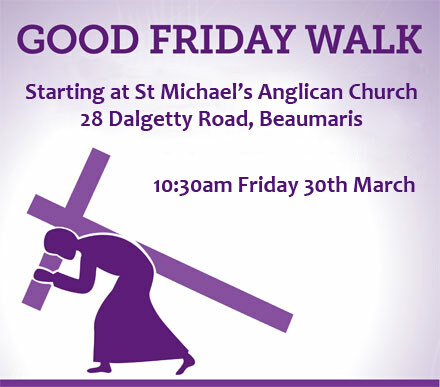 This fabulous event is fortunate to have the backing of the Mordialloc Light Opera Company (MLOC) and the Southern Area Band. Roger Wilson, O.A.M., hosted this event for his 40th consecutive time, a mean feat by anyone’s standards. 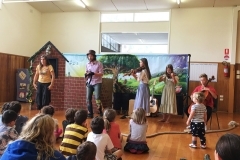 We had solo performances from Katrina and Lucinda Pezzimenti. 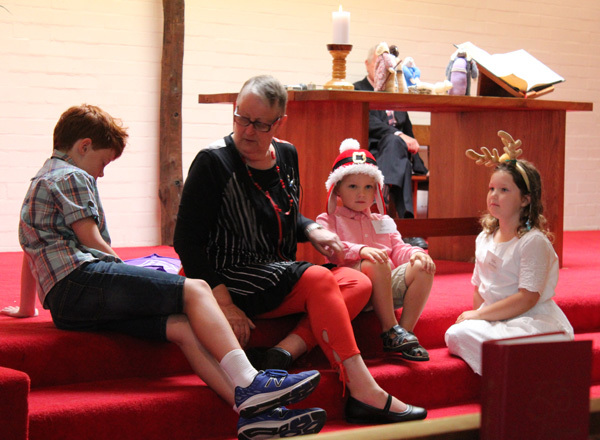 Large numbers of families from near and far joined in the singing of carols, whilst picnicing on the lawns. A visit by the man in red and white is always a hit for the children (of all ages). 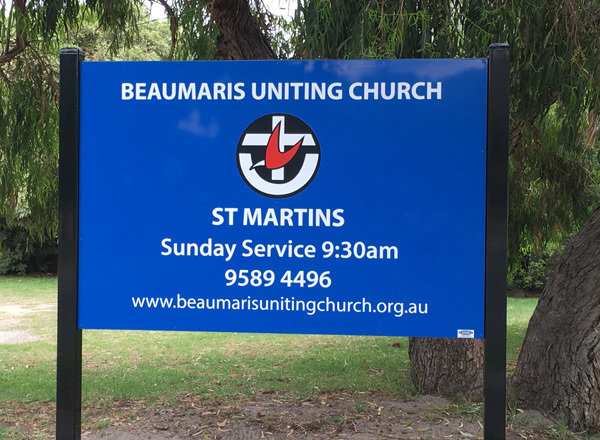 We are grateful for the sponsorship of the Bayside City Council and the Beaumaris Bendigo Bank, without whom this event would not be possible. Thanks also to Hocking Stuart for donating the signs around the area. 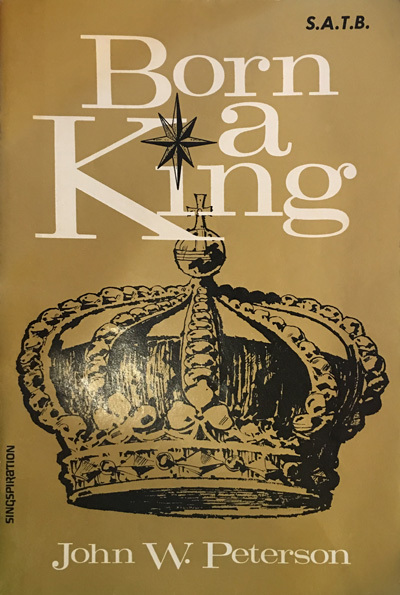 Born A King is a brilliant unfolding of the Christmas story in both song and word, written by John W. Peterson. The Cantata begins with a number of prophetic passages and proceeds through the main events of that glorious night. We had solo performances for Soprano by Katrina Pezzimenti and Shirley Tillett, Tenor: Geoff Hinde and Baritone: Graham Webster, together with scripture narration by John Barklamb, Shirley McKenzie, Sylvia Parry and Graeme Keys. We appreciate the wonderful piano accompaniment by Tanya Chaves.